Gladiators (Latin for swordsmen) are one of the romanticized aspects of ancient Rome. From Neoclassic (19th century) paintings to movies and television series, such as Gladiator (2000) and Spartacus (1960), gladiators have always made for fascinating storytelling. Gladiators were combatants during the Roman Republic and the Roman Empire who entertained the masses in arenas against other gladiators, wild beasts, and criminals. Gladiators were usually slaves, criminals, or prisoners of war who could become professional fighters if they survived long enough to improve their skills and training. Citizens could later volunteer to become a gladiator, but Emperor Tiberius tried to abolish this law (15 CE). Some Roman emperors even participated at gladiatorial games, but they weren’t in any real danger. Especially Emperor Commodus, who thought of himself as the reincarnation of Hercules, was keen to enter the arena. Though gladiators didn’t have any social status, they were revered by the crowds and were often shown in lower and higher forms of Roman art. There were a lot of different types of gladiators, such as the retiarius, who carried a net and a trident, or the bestiarius, who was specialized in fighting wild animals such as bears, bulls or lions. There were also female gladiators and at certain moments in Roman history, gladiators were used in military campaigns or as bodyguards. The most famous gladiator was probably Spartacus, a Thracian gladiator who was one of the slave leaders in a major slave uprising (73 – 71 BCE) against the Roman Republic. Arena of Justice on Geonosis. Gladiators are one of several aspects from ancient times that have found their way into the Star Wars galaxy. Not only does the Empire use Gladiator-class Star Destroyers and Mandalorians fight with Gladiator-class Assault Fighters, there truly are a lot of gladiatorial fights in the galaxy. 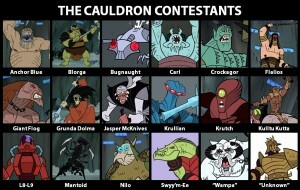 They are organized on several planets in deadly arenas, manned by all kinds of gladiators. Gladiators sometimes are the most important form of entertainment for powerful and cruel potentates, hoping to please their subjects by this primitive form of recreation. When gladiator droids were introduced into the world of gladiatorial games, it meant the fan favorites no longer had to die. Droids can be outfitted with even more brutal weaponry and can take more damage than organic combatants. A whole new genre of droids was thus introduced, such as the Rodian-built RHTC-560 Hunter Trainer and the invincible Mark X Executioner. Now let’s have a look at the most infamous gladiatorial combat arenas in the galaxy. 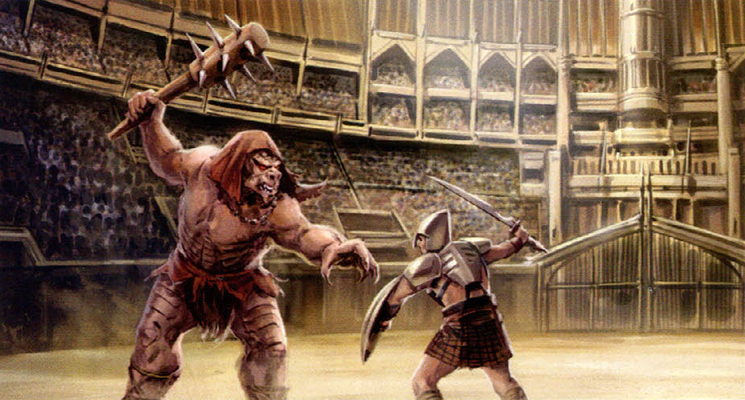 Petranaki was the ancient art of arena combat that gave its name to the gladiatorial games on Geonosis. Today, these matches serve as prestigious trials for Geonosian overlords to prove their strength, becoming very popular on Geonosis since they offer entertainment to the highest and lowest classes in the Geonosian society. The combatants are usually prisoners, criminals, enemies, and Geonosian drones. Certain drones, with exceptional intelligence, were able to become very popular such as the experienced “Acklay Chopper” and Poggle the Lesser, Archduke of the Stalgasin hive during the Clone Wars. The Geonosians usually pit their prisoners against ferocious beasts. Certain native lifeforms almost became extinct because of their extensive use in arenas. Therefore, the Geonosians depend on non-native creatures to entertain the crowds. 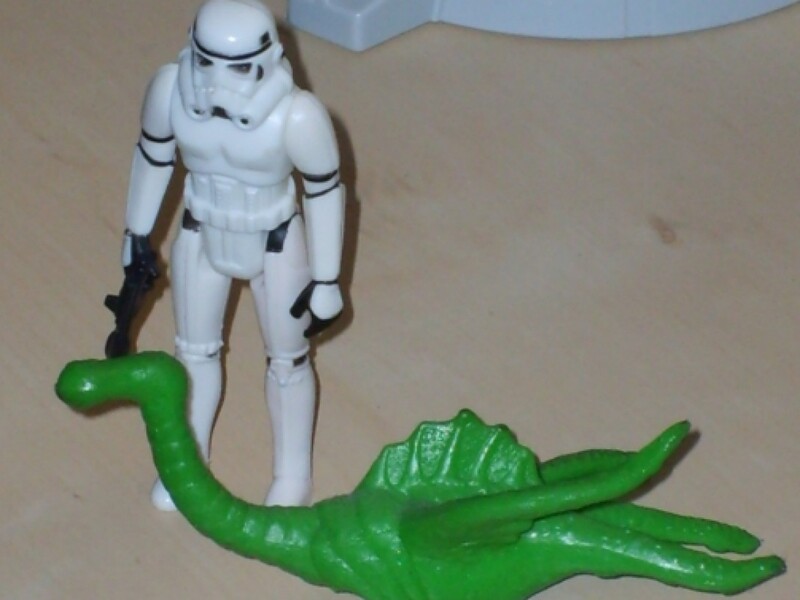 With the help of reptilian orrays, Geonosian Picadors have the dangerous task of leading these beasts towards their victims. Right before the Clone Wars started, the Stalgasin Arena of Justice was filled with Geonosians, craving to see Senator Amidala and two Jedi fight a nexu, a reek, and an acklay. The heroes of the Republic managed to survive, but very soon the arena would turn into a true massacre when outnumbered Jedi confronted Battle Droids and Geonosians in the first battle of the Clone Wars. 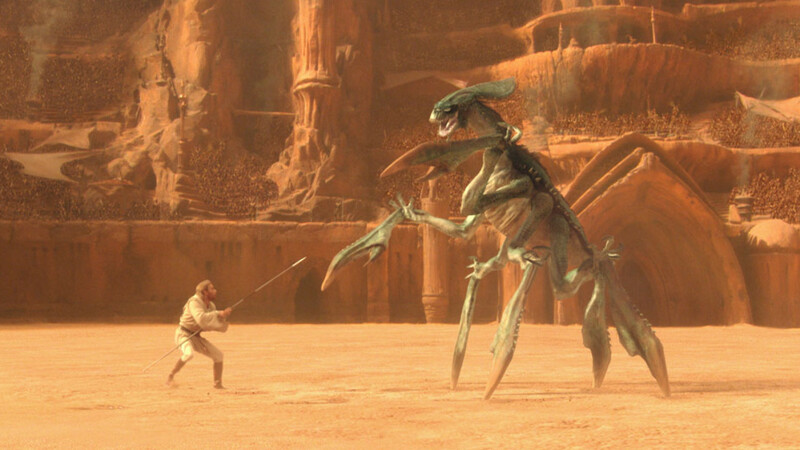 Other creatures used in the arena are the mongworst, a deadly insect from Geonosis and the tenacious massiff. Traditional Petranaki ritual weapons on Geonosis include the Picador’s Spear, the Confessor’s Whip, the Petranaki Scimitar, the Caster’s Net and the Beastwarden’s Shield. 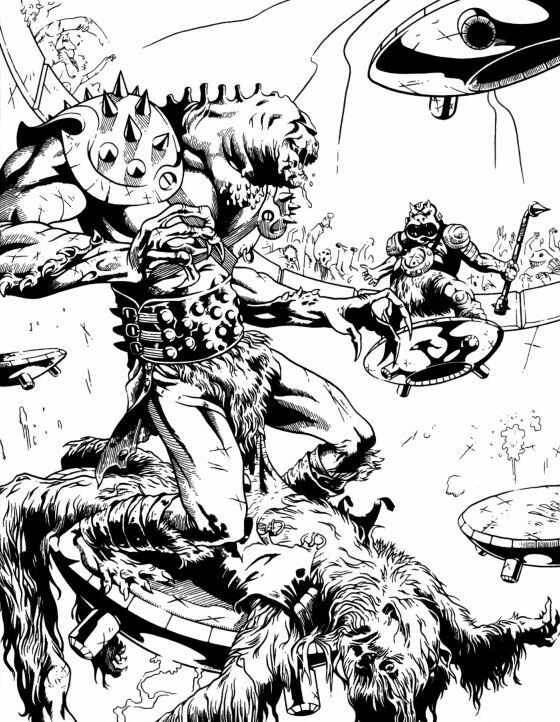 A Geonosian Picador tries to control a nexu. 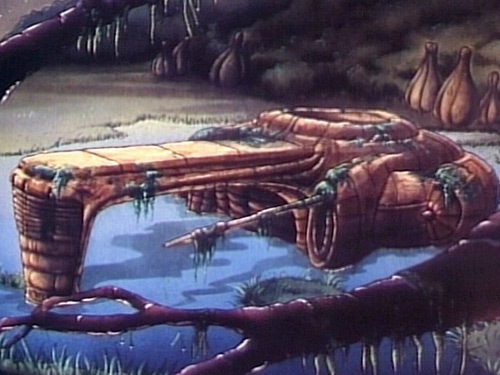 The Cauldron is a gladiatorial arena on Rattatak, once set up to generate money to fuel the wars on the planet. Barons, generals, and other notables attend the fights to find soldiers for their wars. Gladiators are pitted against a wide array of warriors and monsters from a dozen worlds, often provided by shady slavers. Just after the onset of the Clone Wars, Count Dooku came to visit the arena. Asajj Ventress hoped to impress the Sith Lord by making short work of all the other combatants in the arena, which ranged from experimental droid prototypes such as L8-L9, to towering creatures such as a wampa. Dooku was impressed enough to take Ventress on as her Sith apprentice, but not after besting her on the arena floor. Sith apprentices were apparently eager to show off their skills against pit fighters; Darth Maul once dueled the Force-sensitive Drovian Silus in a dueling arena. During the Clone Wars, R2-D2 and C-3PO nearly became victims of a brutal gladiatorial game, organized by Weequay pirates aboard their ship, the Marauder. After the two droids ran out of power on the planet Balnab, they were found by two patrolling pirates. In the pirates’ arena, the ruling champion was the customized ASP droid K0-5D, nicknamed Maximo. 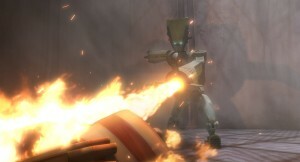 Maximo was outfitted with a flamethrower he used to defeat his opponents. Ironically, it was General Grievous who saved the droids by blasting the hull of the Marauder. R2-D2 and C-3PO managed to float away, only to land in the hangar of Grievous’ Providence-class Carrier/Destroyer. These gladiatorial matches were nothing but cheap entertainment for the bored pirates, since K0-5D had to fight nothing but hapless class-3 droids. The gladiator arena owned by Mondo-Mod the Hutt, the Arena of Doom, was also shut down during the Clone Wars. Jedi Master Luminara Unduli defeated all the combatants, and with help of her Padawan Barriss Offee, she was able to clear the owner’s accounts by some strategic gambling. 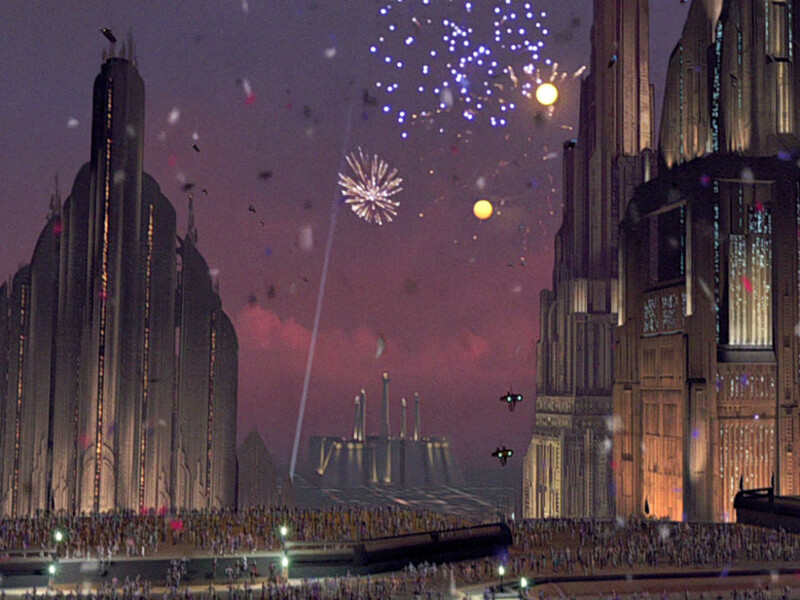 They left the arena with all the money and the coordinates for the Separatist weapons factory on Diorda. Arena fights are also organized with volunteer combatants, as it is one of the best ways to show one’s skills against (more or less) battle-hardened opponents; on one occasion, Count Dooku invited some of the most notorious bounty hunters of the galaxy to fight each other in the Box, a combat arena filled with deadly traps invented by the Phindian master criminal Moralo Eval. 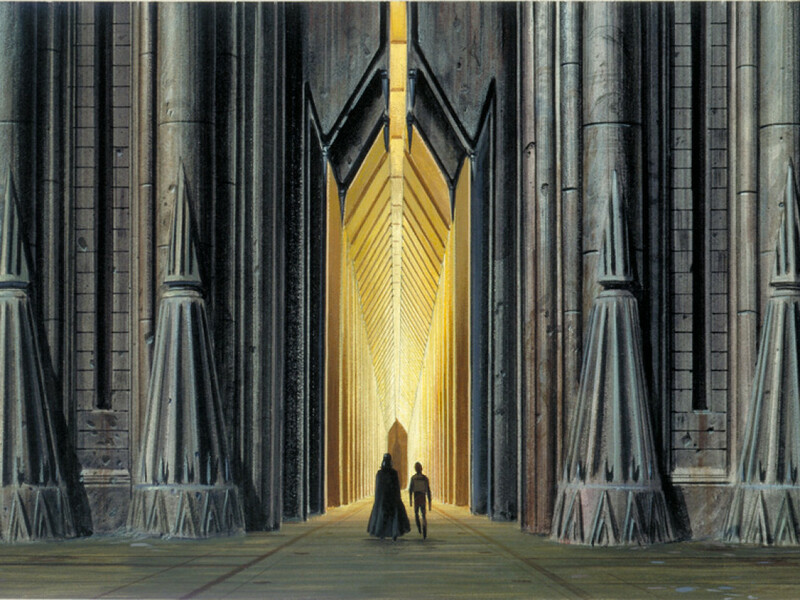 Only five could exit — five who would be contracted by Dooku to kidnap Supreme Chancellor Palpatine. A contract which, of course, would come with a small fortune as reward. Obi-Wan, disguised as bounty hunter Rako Hardeen, would proceed to be part of the final survivors, in order to thwart Dooku’s plan. Han Solo and Chewbacca weren’t strangers to gladiatorial combat. When Han visited the planet Mytus VII, the Corellian carefully infiltrated the Corporate Sector Authority facility known as Stars’ End. Han and his companions were planning to rescue (political) prisoners from the Corporate Sector, among them Chewbacca and the outlaw tech Klaus “Doc” Vandangante. As the marksman in Madame Atuarre’s Roving Performers, Han managed to avoid a duel against Uul-Rha-Shan, the Tiss’shar gunslinger of Viceprex Mirkovig Hirken. But it was the unfortunate BLX-5 and Blue Max who were destined to enter Hirken’s gladiatorial arena to fight against the Mark X Executioner. BLX-5 (Bollux) might have been known as the “Annihilator” in Madame Atuarre’s Roving Performers, the labor droid stood no chance against a real gladiator droid. The Arakyd Industries Mark X Executioner was considered the best gladiator droid of its time with ten deadly weapons hidden or attached to its multiple arms. Official gladiatorial droid competitions didn’t even allow the droid to participate, unless it fought against another Mark X. Still, BLX-5 and Blue Max managed to prevail by exploiting the only weakness of the Mark X: an unarmored section underneath its tracks. The Big Game gladiator match. After the Battle of Yavin, the heroes of Yavin were in a lot of trouble when they visited the Wheel, the famous gambling station in the Besh Gordon System. 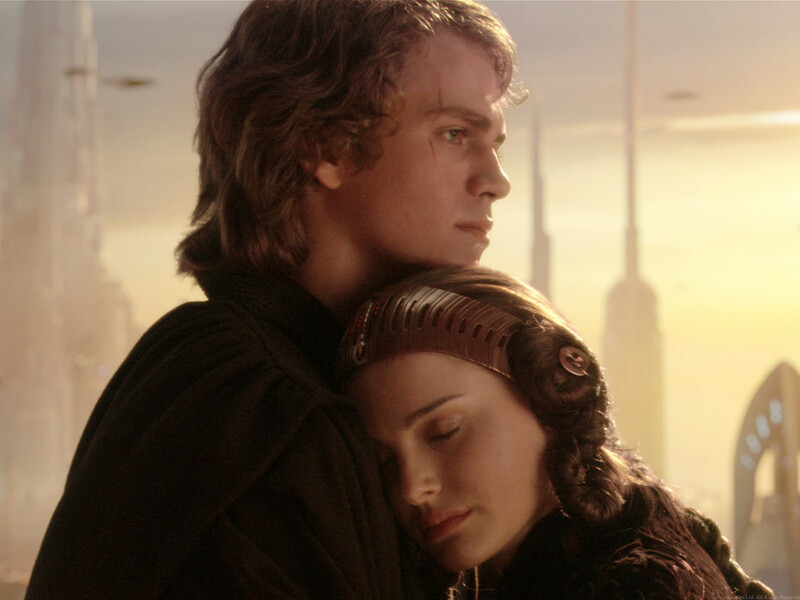 When Leia was recognized by Administrator and former Senator Simon Greyshade, it didn’t make their situation easier and less dangerous. When Chewbacca started a brawl at the Crimson Casino, he was imprisoned and offered a choice: to volunteer as a gladiator in the Big Game or to be sent to the Spice Mines of Kessel. 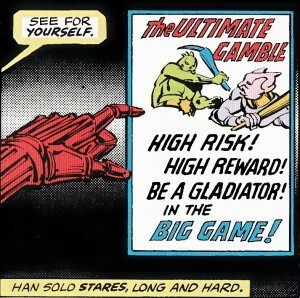 When Han Solo found himself without any options left (Luke, Leia, and Chewie were missing) he also volunteered as a gladiator for the Big Game. That gladiatorial game was established during the rule of Administrator Kelek the Blue and Greyshade continued to use it for entertainment. At first the volunteers had to endure several deadly traps before entering an arena. 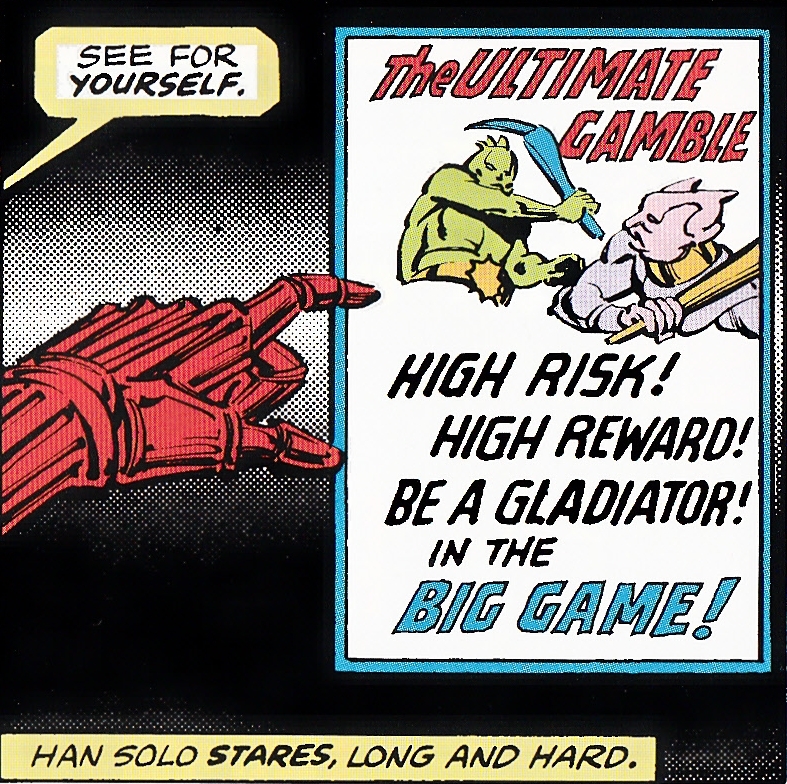 Han’s opponent in the preliminary contest was a huge Ultaarian Greenback armed with dagger thorns, but the final test wasn’t exactly what Solo had planned. Only one contestant could win the Big Game and with Chewie being one of the other gladiators, Solo had to devise a plan of survival really quick. The final battle was fought in artificial zero gravity and all gladiators were armed with a miniature ray shield and a blaster. 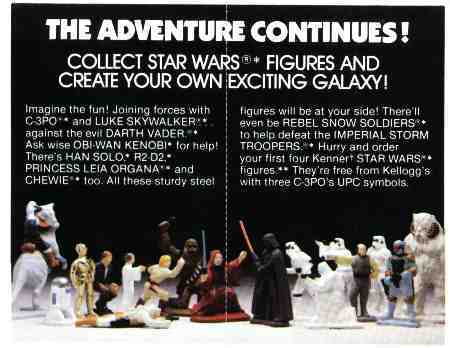 Han and Chewie formed a team to defeat the other gladiators, including a blue Night-Soarer. When Han and Chewie were the only ones left, Han urged his loyal friend to shoot him, which he did. But nobody had noticed that Solo had hidden the ray shield under his shirt. Han was quite alive when stormtroopers tried to arrest Chewbacca after the Big Game had ended. Chewbacca finishes off Big Bruiser. Antipose is a planet in the Centrality that was visited by Han Solo and Chewbacca after the Battle of Yavin. Raskar, the last remaining pirate of Iridium, organized his own gladiatorial combats on Antipose for pure profit. With help from his female bodyguard and assassin, the mysterious exotic gunslinger Mystra, Raskar only allowed official matches in the Antipose Arena. The object of the gladiators’ desire was a rare Power Gem, a mineral that had the power to disrupt deflector shields and other magnetic shielding. What the gladiators didn’t know was that Raskar’s Power Gem was nearly depleted of all its power. While Chewie started an impromptu duel against a huge alien, Han profited from the distraction and entered Raskar’s hideout to steal the mineral. 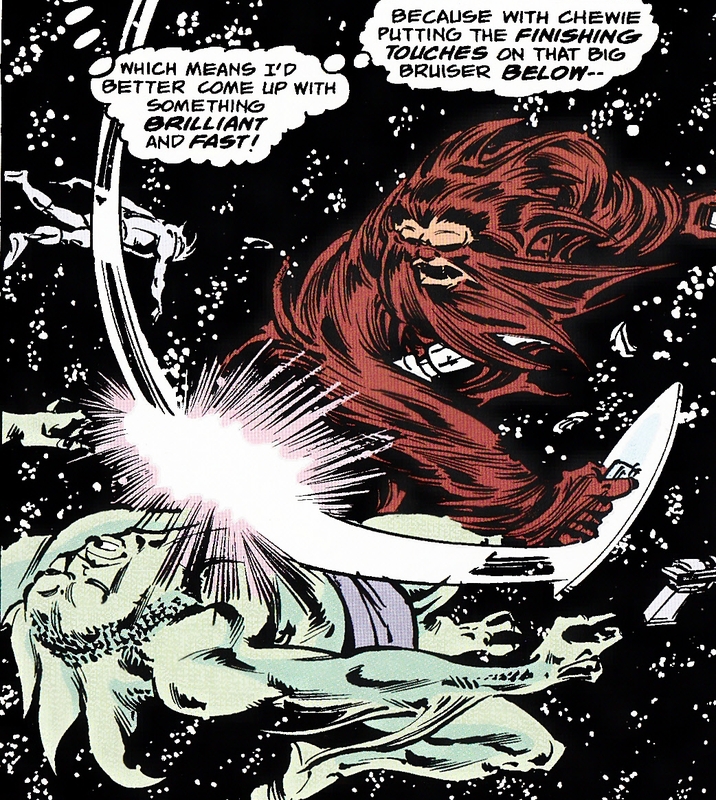 When Han learned the truth about the Power Gem, he advised Raskar to abolish his fraudulent games and declare Chewbacca as the official winner. Cromag in Pelkan’s pit on Questal. 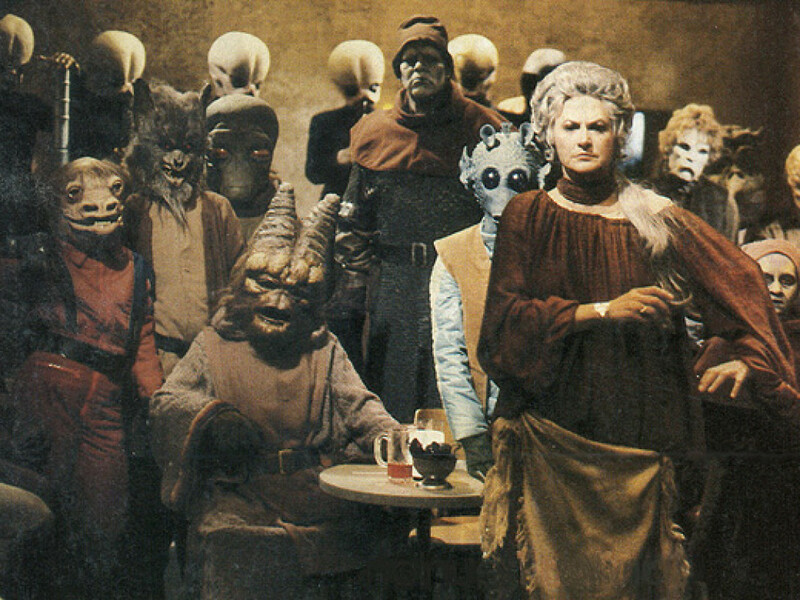 Han and Chewbacca weren’t the only rebels who ended up in the arena. The planet Questal in the Core Worlds was home to Mosh Pelkan’s luxury mansion. This Mephitisian crime boss held his own gladiatorial fights in a pit where contestants had to do combat on repulsor discs. Pelkan’s champion was a giant humanoid known as Cromag. During the Galactic Civil War, a team of Rebel Alliance operatives traveled to Questal to find the missing rebel agent Tay “Tiree” Vanis. In 1 ABY, Rebel general and former Jedi Master Rahm Kota was imprisoned in the Tarko-se Arena on Cato Neimoidia, where he was forced to fight in gladiatorial battles. After surviving for seven days, the Starkiller clone would eventually rescue him. Upon his arrival, Baron Merillion Tarko hoped to stop him by releasing one of the largest monsters ever seen in an arena, the immense Gorog. Starkiller managed to defeat the creature, and simultaneously destroyed enough of the arena to bring it down entirely. Gladiatorial games, arena fights, pit fights… As you see, there is an endless array of violence adapted for entertainment purposes, whether it’s the weekly gladiatorial battles in the Temperance Arena on Nyriaan, the illegal pit fights below the Outlander nightclub on Coruscant, the pits of Loovria that entertain the nobles of the Senex-Juvex sectors, or who knows what in the Jango Fett Arena in Mos Eisley, Tatooine. As long as there are crowds to be entertained, there is money to be earned. 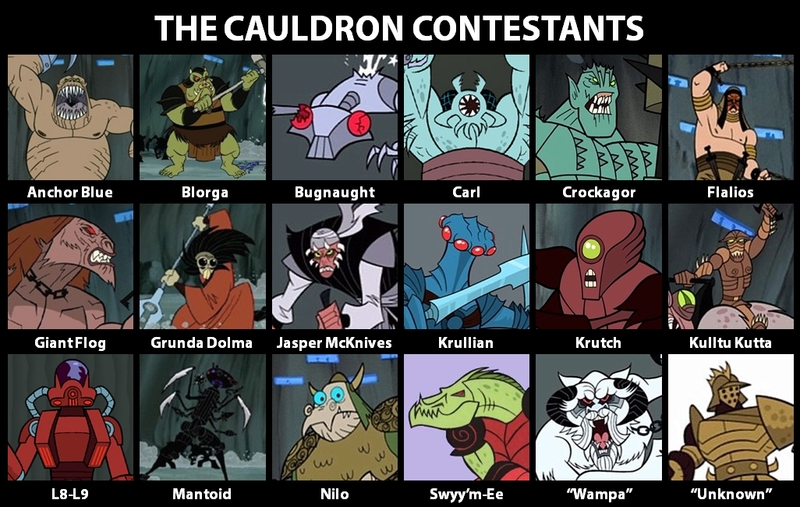 And as long as slavery and wars exist, there will always be a steady supply of fresh combatants, awaiting their turn to face the likes of the Great Goblin, Anchor Blue, Gjo’Fomaan, or Yubookoo. Tim Veekhoven (Sompeetalay) from Belgium is president and co founder of TeeKay-421, the Belgian Star Wars Fanclub. 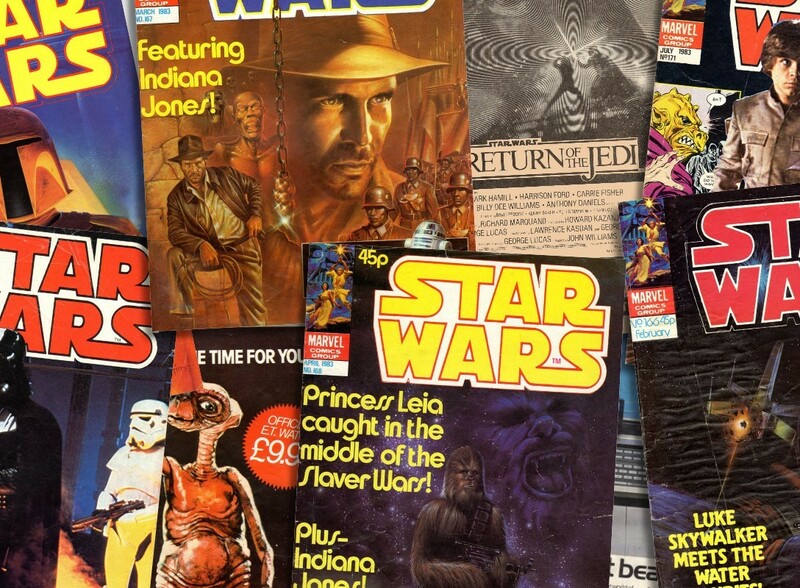 He has contributed to Star Wars Insider (Rogues Gallery), is an administrator for Yodapedia, and has written four character back stories in “What’s the Story?”.